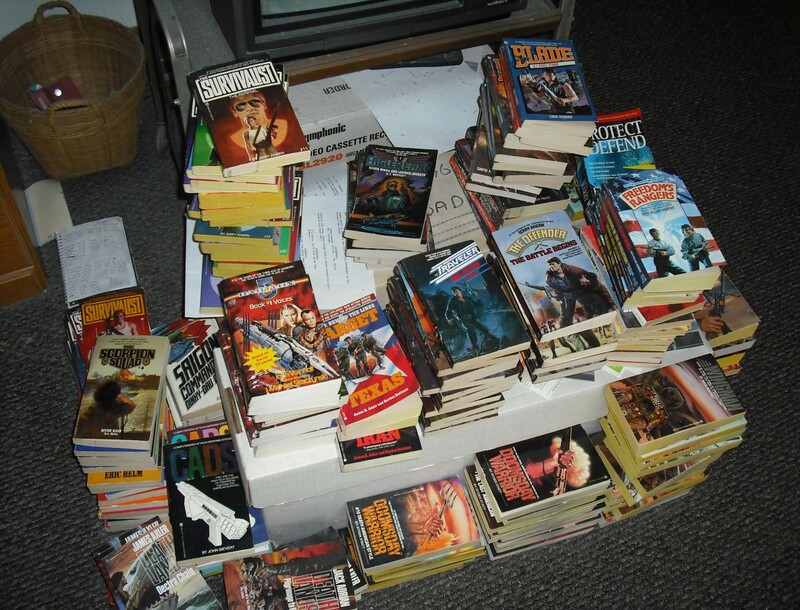 Pellucidar – THE BOOKS THAT TIME FORGOT. Christopher West is a graduate student in biology. His associate a Dr. Kinsley has developed a matter transportation beam and is using it in a project to drill deep into the earth. While visiting him they are surprised when the drill breaks into a cave that is inhabited. The primitive inhabitants start to worship the drill and are going to offer up human sacrifices. Chris springs into action. He grabs a fire axe and uses the matter transmitter to teleport him to the cave. There he rescues a beautiful woman named Var-na. 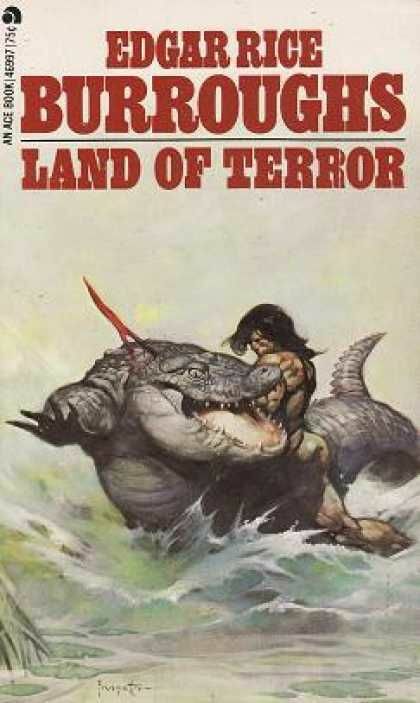 They escape to her village and Chris finds out that he is the land of Pellucidar the inner world. He is called Red Axe after his weapon and settles into an idyllic life among his new friends. Later representatives from the cave tribe arrive with a message from the gods. Chris decides to go back to tell his friends about his discovery and with his mate Var-na head back to the cave. They are betrayed, captured and sold to the Mahars. Taken to this race of intelligent reptiles city the two are made slaves. The book then deals with Red Axe’s efforts to free him and his friends from the Mahar city. One of the few books authorized by the Burroughs estate I found it an interesting book. Holmes stays true to the spirit of the world Burroughs created yet adds his own unique style. It takes place in a different part of Pellucidar so there is none of the characters from the series. 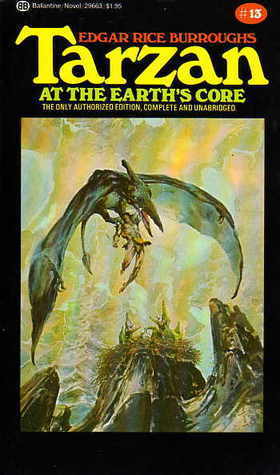 He is supposed to have written a sequel called Red Ax of Pellucidar but the Burroughs estate blocked it in a dispute. I hope some day to read it. Holmes reinvigorated the series in a new direction. David Innes is visiting the tribes of his empire. He is betrayed by the king of Kali and taken prisoner. As this goes on Dian his mate is testing out a hot air balloon. It breaks its moorings and carries her off to unknown lands. What follows is your basic quest of the various parties involved to find one another. It takes them to a land across the ocean inhabited by men with bronze age technology. Along the way there are new dangers, new people and new creatures. This is the final book in the Pellucidar series. Actually it is a collection of four stories that link together. Three of the stories were discovered after Burroughs death and published posthumously. I thought it was an exciting adventure and a good addition to the series. 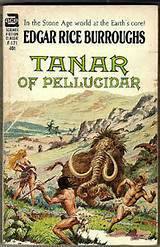 My final thoughts on the Pellucidar series. I really think it was a unique idea. I am always a sucker for lost prehistoric worlds. He created a rich land full of endless possibilities. The sixth series in the Pellucidar series finds David returning from his expedition to find Von Horst. He is captured by the women of Oog. Oog is a land were the roles of women and men are reversed. He manages to escape but then fall into captivity by the Jukans. It is here that David is reunited with his mate Dian. She had set out to find David and was also captured by the Jukans. They both escape and have further adventures with giant men, giant ants and floating islands before reaching their home of Sari. 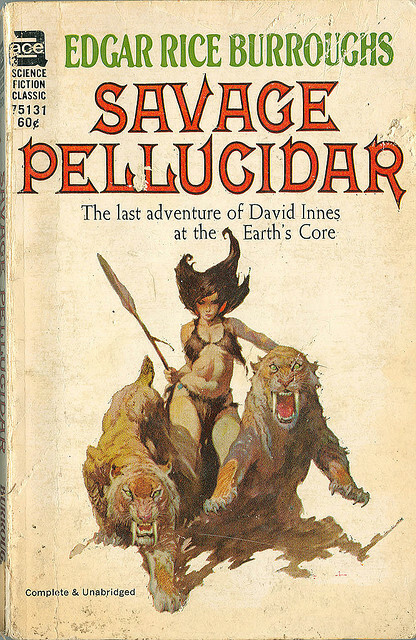 The final Pellucidar novel that was published in Burroughs lifetime. The story was a solid adventure if not distinguishing itself in any special way. I would place this in the good not great category. In the last book one member of the expedition from the O-220 was never accounted for. This is the story of Erich Von Horst. Erich or as the locals call him Von got separated and captured by the Torodon (pterodactyls). There he meets Dangar a fellow prisoner from Sari. The two escape and form a friendship. While on the way to Sari they meet Skruf and are tricked into accompanying him back to his village with promises of friendship. Instead they are betrayed and forced into slavery. While there Von meets La-ja a fellow prisoner. Von organizes a slave revolt and the three escape. They then have adventures in trying to return La-ja back to her tribe. They encounter the Gorbuse, an underground race of cannibalistic albinos. Then they have to survive the Mammoth men. Von and La-ja make it back to her tribe. There Von kills the evil Gaz, wins the love of La-ja and the chieftainship of the tribe. At the end an expedition lead by David arrives looking for him. Von decides that he would prefer to remain in Pellucidar. The next book in the Pellucicar series is a good solid adventure story. Nice to see that he didn’t forget about poor old Von Horst. Jason Gridley has mounted an expedition to rescue David Innes from the Korsar dungeon. While in Africa to obtain a light metal for the dirigible that he will use he encounters Tarzan. He convinces him the join the expedition with his Waziri warriors. The dirigible named the O-220 takes off from Germany and enters Pellucidar through the North Pole opening. Here Tarzan decides to do some exploring but gets lost in the unfamiliar environment. Jason leads an expedition to find him and is attacked by a pride of Saber-tooth tigers. Jason gets lost from the rest of the expedition and finds Jana fleeing capture from a hostile tribe. What follows is the adventures of Tarzan intercut with that of Jason and Jana. Eventually they reunite and are able to free David. This book has a lot of sentimental value for me. I was thirteen and had just moved to Elko Nevada. I had no friends and this was before the internet and video games. My mom took me down to the library that summer to find a book. I decided on this one. 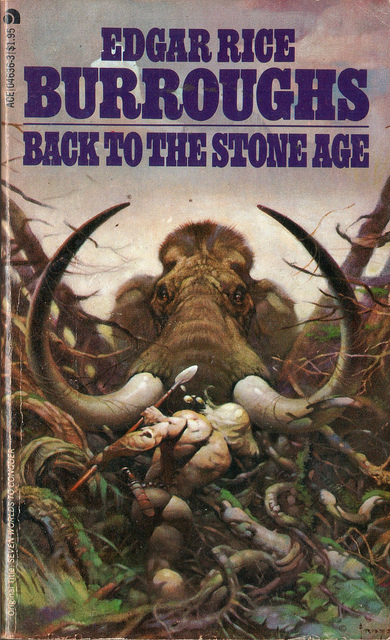 It had a cool name with a cover of a mammoth fighting off saber-tooth tigers. I had loved to old movies and comics of Tarzan so I thought I would give it a try. That day I fell in love with reading. The adventure of an exotic world filled with cavemen, dinosaurs, saber-tooth tigers, pirates and snakemen captivated me that day. I spend the rest of the summer reading every book from ERB from the library. I eventually branched out to other authors. I guess fate choose that time and place with this one book. It inspired me to want to be a writer. Something that I am seriously finally pursuing in life. Jason Gridley is experimenting with a new radio wave when he gets a message. His invention has made contact with Pellucidar and Abner Perry. Perry recounts the story of Tanar. The Empire of Pellucidar has grown and prospered since the overthrow of the Mahars. A new enemy comes to the shores of the empire. Korsars, descended from eleventh century Spanish pirates attack. They are repulsed but at great cost. Tanar the son of Ghak the king of Sari has been captured. The Korsars want to get the secret of the empires superior gunpower and bring Tanar to their capital. Along the way a storm shipwrecks Tanar with Stellara the daughter of the Korsar leader. Through a series of adventures the two fall in love are recaptured and taken to the Korsar city. There they are united with David Innes who was also captured. Tanar and Stellar escape after finding the north polar opening to the surface world. Emperor Innes is still a prisoner in the dungeons of the Korsars. The book ends with Jason deciding to mount a rescue mission. This is probably one of my favorite stories that Burroughs wrote. Tanar and Stellara are a classic romantic tales. It also sets up the only crossover that Burroughs did Tarzan at the Earth’s Core.